Based on an age old Sicilian recipe, Filippo Berio Tomato and Ricotta Pesto combines the sweetness of tomatoes with the rich smoothness of ricotta cheese, combined with fine Filippo Berio Extra Virgin Olive Oil. Simple to prepare, memorable to experience. 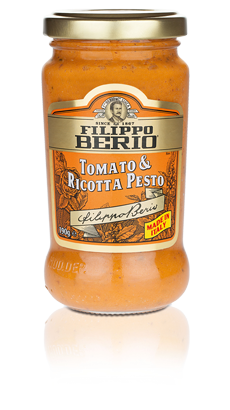 Filippo Berio Tomato and Ricotta Pesto is an ideal accompaniment for cooked pasta, fresh vegetables and baked potatoes. Or add it to sandwiches and soups for added flavour.